#1.1 Buyer’s Guide: How to Make the Right Choice? 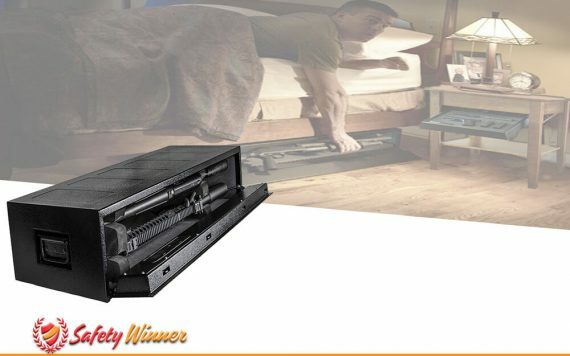 #1.2 7 Best Under Bed Gun Safes on the Market! #1.3.1 Why should I get an under bed gun safe? #1.3.2 Why Not Just Get a Nightstand Safe? #1.3.3 Why Not Just Bolt a Safe to the Wall? #1.3.4 Should I Bolt My Safe to the Bed or Floor? #1.3.5 What Is the Best Kind of Lock? #1.3.6 Should I Just Store One Firearm? While having a safe to store your firearms is a smart investment, not all people want a large gun cabinet in their closet or installed into their wall. Some are looking for a more discreet and out-of-the-way location for their safe, and this is why purchasing an option that easily slides under your bed makes for the perfect choice. An under the bed safe still allows you to have quick access to your firearms, especially if you are sleeping. Plus, it gives you a covert location where your kids may not even be aware that you have firearms located within your home. It’s the ultimate safety place. Buyer’s Guide: How to Make the Right Choice? While having an under bed gun safe is a great idea, there are some things you should know that will help you to make the right kind of choice for yourself. Factors that will assist you in making the right decision. Storage Space. The amount of storage space you need will be dependent upon the kind of firearms and other valuables you intend to store. If you have long rifles, there are safes that are built to specifically accommodate larger sized firearms. However, you may only need a small safe if you have a pistol or two. Type of Lock. There are three primary types of locks out there: combination, digital, and biometric. In determining what is the right safe for you, you want to decide whether you want something that is much quicker to open, like the biometric type of lock, or to go with the standard type of combination option. Power Supply. If you decide upon a biometric or digital lock, you also have to consider the power supply. These options will not work if you don’t have power to them, meaning you will either need to choose one that comes with a cord that you would plug into an outlet or to go with batteries. Batteries remove the need for a cord coming out of the safe, but you also have to replace them on a regular basis. Mounting. Does the safe come with the hardware and is it predrilled to allow you to mount in place. Some prefer to buy a safe that they can mount directly underneath their bed, by attaching it to the floor. Weight. Many people will use a safe like this in their truck or while they travel. This makes portability important. You want to safe that you were able to easily slide out from underneath your bed in an emergency, but you may also want one that you can take with you while you travel on airplanes or in your vehicle. 7 Best Under Bed Gun Safes on the Market! Now that you have some idea of what to look for in choosing the right safe for yourself, it would be a good idea to get some suggestions of top-quality options that are available. Here are five that you may want to consider when determining what safe is best to fit your needs. This vault is a large capacity option that gives you an internal storage space of 44.75 inches long by 26 inches wide, by 5 inches tall. That gives you plenty of space to be able to store at least four long rifles or a large number of handguns. There’s a good reason why it is referred to as the Monster vault. The door opens down, allowing you to slide your weapons inside the safe. It weighs 100 pounds, still making it so that it is easy to slide in and out of the space underneath your bed. In fact, it is so well designed that it may even fit underneath the seat in your truck, allowing you to take it with you when you need to. The vault is made with a durable double steel wall construction, and comes with a fantastic digital combination lock. This allows you to program your own passkey, using anywhere from three all the way up to eight digits. This adds an additional level of security as people can’t simply guess three or four digit codes. They have to determine how many numbers there are before they can even attempt to gain access. The keypad is run on battery power. Should the batteries run out there is a backup key that is provided in case of emergencies. The inside is padded to ensure that your valuables do not get scratched or damaged when removing items from the safe. This is an outstanding product, with a great design. Because it is only 5 inches tall, it easily slides under the vast majority of beds with no issues. It is truly a fantastic choice. A lot of gun owners preferred the slide out options, and as they not only provide adequate space but are easily concealed underneath your bed. This is another great option that gives you all the advantages of an underneath bed safe that is well constructed and well designed to alleviate your security concerns. The inner tray of the safe is 43.25 inches long by 13 inches wide, giving you plenty of room for at least one rifle or several different handguns. 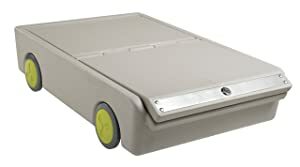 It is nearly 4 inches tall, which gives it a low profile, making it easy to slide under almost any bed. The safe is made of a heavy duty 14gauge steel and is built to be impact and pry resistant. The interior comes with a slide out bar, allowing you to easily pull your firearms out of the safe in an emergency so you are not fumbling around trying to grab your weapon in a situation where seconds count. A high-tech digital locking system is used to secure the door in place. A black light is positioned over the keypad, making easier for you to be able to see in low light conditions. You are able to program your own code into the keypad, and it is powered through use of standard batteries. If you only need a safe that is able to store a single long rifle or a few pistols with some additional valuables, this could be the choice for you. It weighs about 75 pounds, making it easy for you to be able to slide in and out from underneath your bed. Adjustable interior racks allow you to divide the safe to fit your organizational needs. This safe is the perfect option for a person who is looking for a vault that easily slides under their bed or that fits in their truck. In fact, the vault was created for both options. What makes it unique starts with the design. It is large enough to be able to store too long rifles and at least one additional handgun. However, it is not cramped, making it easy for you to lock the door in place. Many gun enthusiasts like this safe because it’s perfect for those who have an AR-15 or similar style weapon. The internal dimensions are 40.5 inches long by 14.5 inches wide, giving you plenty of space for automatic rifles, especially as it is 5.5 inches tall, giving you some additional space. The safe is made of a 14gauge steel which is both tamperproof and pry resistant. If you don’t have long rifles but are still looking for a safe that provides you with plenty of space, what you will like about this option is that it gives you the ability to install two dividers that allow you to have your safe be better organized. This is the perfect option for those that have a few handguns that they want to store in their own individual bay while still having plenty of room for ammunition, jewelry, and other valuable item. Plus, the interior is well-padded, ensuring that your valuables are protected and will not get scratched or damaged. The safe weighs 54 pounds, making it easy to slide under your bed or to take with you. It even includes handles on each side to help with portability. Maybe portability is the biggest concern for you. If that is the case, then you are going to love this lock and roll portable safe. Before going any further, it is important to note that this is an option that is really not built to be a weapon storage container. 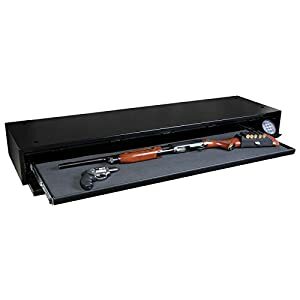 It is a great place to store valuables, and comes with wheels on each side that makes it easy to slide in and out from underneath your bed, but the locking mechanism and the design of this box is not durable enough to be a good safe for your weapons. The container is 26.5 inches long by 16.3 inches wide and has a depth of 5.8 inches. A standard keylock is used to secure the door in place, and the door is designed so that you can pull a portion of it open without exposing the entire contents of the lockbox. It easily slides under the vast majority of beds, making it something that you can easily hide in any room. At only 12 pounds, it is easy to move. The container is made of plastic, which helps to keep it lightweight. However, it also makes it easy to get into. It’s perfect for keeping kids out, but if a person had a crowbar or long screwdriver they could probably easily get this open. No doubt it will fit a wide assortment of firearms, but this is not the kind of container you want to use for that purpose. #1 Why should I get an under bed gun safe? There are a number of reasons why it is a good idea to get a safe that slides underneath your bed. Not only does it conceal the fact that you have a safe, but it also saves space in your home. #2 Why Not Just Get a Nightstand Safe? If all you are looking for is a storage space for a handgun that is within arms reach of you when you are sleeping, then the nightstand safe is a better option. However, if you have other valuables to store, including both long rifles and additional handguns, then you are going to need a larger size safe. You can still get a nightstand safe, but have the added protection of this type of vault as well. #3 Why Not Just Bolt a Safe to the Wall? This is about concealment. 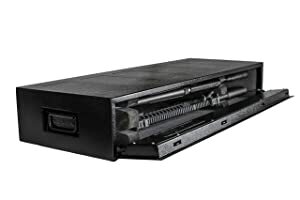 By purchasing a safe that goes underneath your bed, you make it so the vast majority of people would not even be aware that you had a safe. Plus, if you do not want to lock the safe in place, you have the added advantage of concealment without having to secure the safe to your floor. #4 Should I Bolt My Safe to the Bed or Floor? If you can, it is a good idea to do so. Every additional deterrent that you provide helps to keep your valuables secure. When you are talking about firearms, you don’t want anybody walking off with your safe. Securing it in place helps to prevent it from being stolen. #5 What Is the Best Kind of Lock? That is simply a matter of preference. If you are a person who is concerned about someone breaking into your home and you needing to retrieve your firearm at a moment’s notice, then you may want to look at the more sophisticated locks, like the biometric options. #6 Should I Just Store One Firearm? This is a good question, because many are concerned with the accessibility of their firearms in an emergency. 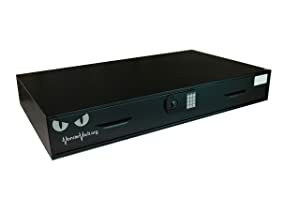 If you look at the safes that were offered in this review, which you have seen is that they are still easily accessible once you open the door of the safe. You could still store long rifles or several different handguns and gain quick access to them. If you have the room, the safes are padded to protect your firearms from being damaged.